YES to sugar-free cookies! 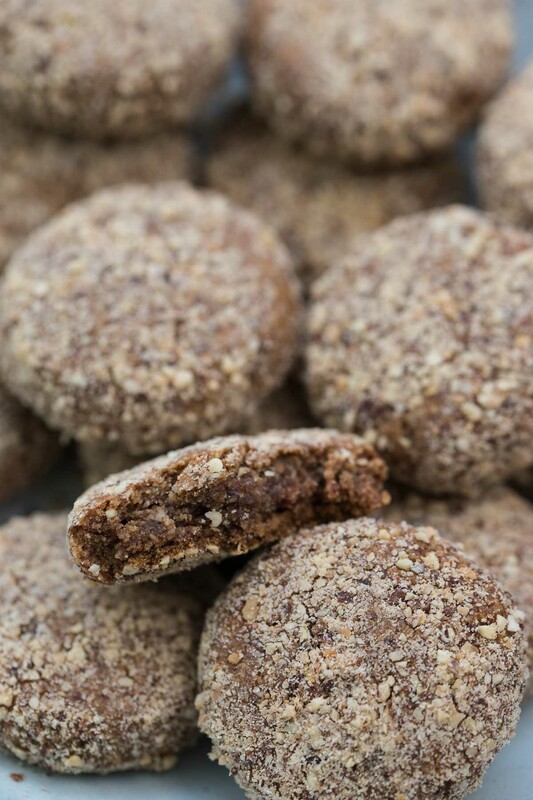 With these almond date cookies there is absolutely no sacrifice on flavor. 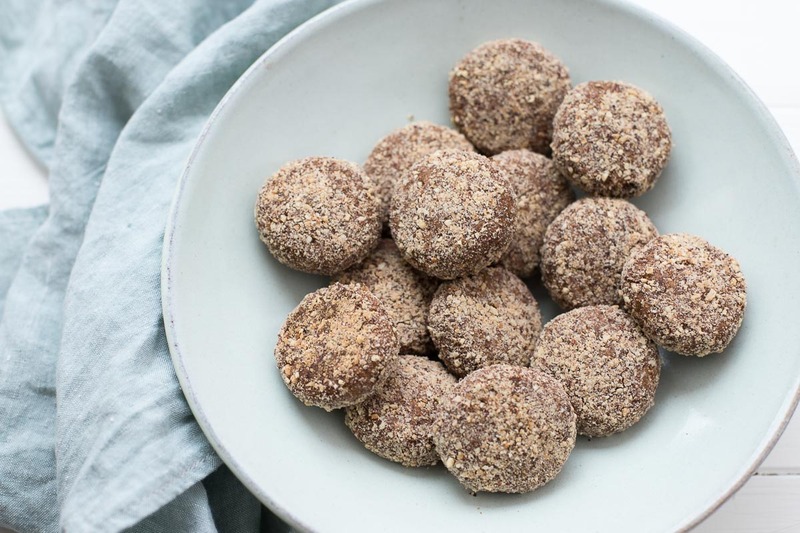 They are made with naturally sweet Medjool dates, ground almonds and tahini. Plus a little spice to deepen the flavor: cinnamon and ginger. 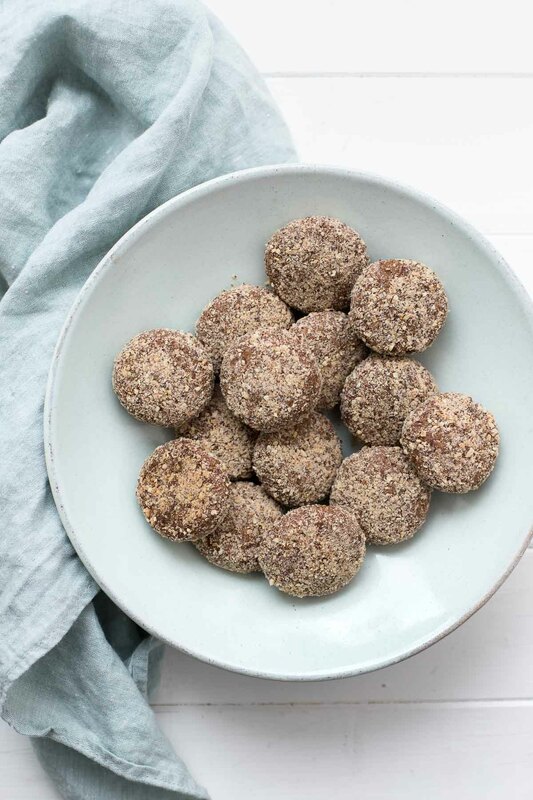 So since there are no flour, no eggs, no sugar, meaning these make the perfect snack for anyone following a gluten-free or vegan diet or… anyone simply looking to eat a little healthier (without feeling they are missing out on a delicious snack). Well, they have a cookie-like exterior with a chewy inside that kind of takes you by surprise. Dates have their own special kind of sweetness which is complimented by a subtle taste of tahini (sesame paste) together with the nutty taste of almonds. I also use a little coarse see salt in these cookies which is really terrific because you only get a little hint of sea salt, and not in absolutely every bite. And these are cookies that grow on you. Or at least for me. The more I ate them the more I loved them. That said, I loved them more when they were fully cooled. Warm , I poked a little piece of dark chocolate in middle to let it melt a little and yeah, oh yeah, that was good. But of course, then this would no longer be a sugar-free cookies recipe. So do these fall into the category of Christmas cookie? Sure why not. Okay, maybe they don’t look as fancy as decorated or sugar-coated cookies, or even thumbprint cookies with their colorful jam in the middle, but they definitely earned a place among my Christmas table. And probably any time I am looking to bake something that makes the perfect healthy snack. If you love dates, you will fall in love with these simple and delicious Almond-Tahini-Date Cookies. They make perfect snack that is sugar-free, gluten-free and vegan. Preheat the oven to 350°F / 165°C and line a baking sheet with parchment paper. Place the Medjool dates and tahini in a food processor and process until the dates are minced and mixture is quite smooth. Use a tablespoon and hand roll into tightly formed balls (about 3 cm in diameter) and place the balls onto the prepared baking sheet. If coating the cookies with almonds, roll the cookie ball lightly in small bowl of ground almonds until completely coated, then place on the baking sheet. Using a small flat-bottomed glass, press down on each cookie until it is lightly flattened to a little more than 1 cm thick. Bake in the preheated oven for 14-16 minutes, or until the cookie edges firm up and are set. The cookies will rise slightly. Remove from the oven and gently transfer each cookie from the baking sheet to a cooling rack. Store the completely cooled cookies in an airtight container. Look for Medjool dates that are soft and moist as these will give you the best results. I pick mine up at the farmers market, but some supermarkets sell them fresh (not packaged) or you can find them at Turkish markets. If the Medjool dates seem dry, then I would recommend soaking them in warm water until they are tender/soft enough. I don't recommend other types of dates for this recipe. If you make this Almond-Tahini-Date Cookies recipe, I’d love to hear how it turned out for you! Be sure to rate it and leave a comment below to let me know! Especially if you have tips for other readers. Or take a picture and tag me on Instagram @ellerepublic and don’t forget to hashtag #ellerepublic so I don’t miss it!